Opened exactly one year ago, the eponymously-named restaurant Muroi is located on a narrow road that climbs into the mountains in the Takagamine neighborhood of northwestern Kyoto. The area was once a remote farming village and artist’s colony during the Edo period (1603-1868). The surrounding hills and mountains look down on the magnificent Zen Buddhist monasteries and imperial country retreats of Daitoku-ji, Kinkaju-ji (the Golden Pavilion), and Ryoan-ji (and its enigmatic dry stone garden) that were built during the Kamakura (1185–1333) and Muromachi (1133-1568) periods. Even though Takagamine has long since been incorporated into the city of Kyoto as a residential neighborhood, it retains much of its bucolic charm and natural elegance. There are still small farms as well as craft shops and cafes, interesting temples like Koetsu-ji, which has a unique Zen garden in the form of a stroll garden, and one of Japan’s oldest family-owned artisanal soy sauce makers, Matsuno Soy Sauce. In addition, Takagamine has no crowds, further qualifying the area as a worthwhile and peaceful destination. Equally compelling, if not more so for lovers of great food, is to go to Takagamine to have dinner at Muroi. Here in a beautifully renovated old kominka, or farmhouse, chef-owner Shigeru Muroi is redefining Japanese cuisine and fine dining. The restaurant is located on the property of Higuchi Nouen, one of Japan’s oldest and most venerable family-run vegetable farms. The cooking Shigeru performs for his guests at the small, kappo style counter-restaurant is a return to the pure expression of the flavors of nature and the power of high quality, natural ingredients. Reflecting the order of the natural world, most of the ingredients are vegetables—fresh, seasonal, and at the peak of their flavor—simply prepared but masterfully combined by someone with a great deal of skill, creativity, and intuition. Shigeru also uses seafood and meats, but these are tucked in as accompaniments and flavorings in dishes and rarely showcased as the main attractions. It is ingredient-based cooking as an art form. Yet, by bringing the well-developed table of Japan’s great culinary traditions to the farm, Shigeru has created a dining experience that is comfortable, familiar, and affordable, as well as elegant and delicious. Shigeru starts each day by harvesting vegetables and gaining inspiration at Higuchi Farm across the road from the restaurant. 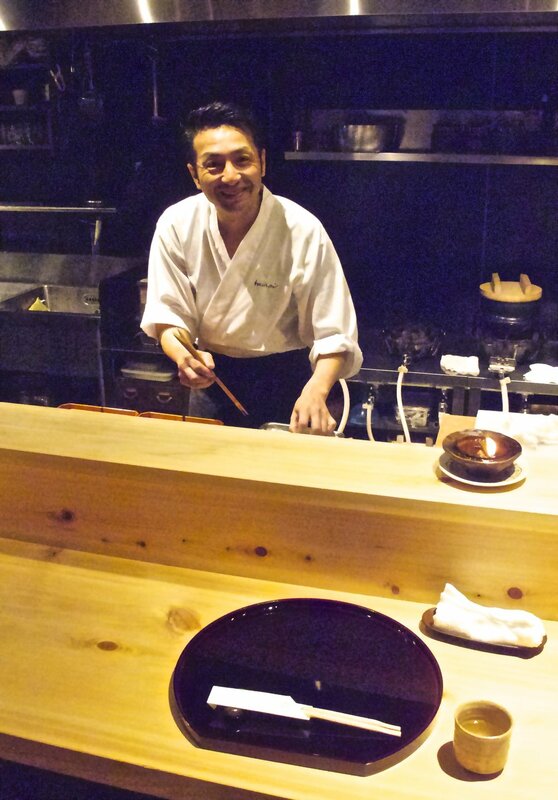 At night Shigeru is behind the counter at his restaurant preparing the meal he has devised that day. Originally from Tochigi prefecture, north of Tokyo, Shigeru attended university in Kyoto. After working for many years at Japanese restaurants abroad, during which time he broadened his cooking skills and gained a freer perspective on Japanese cuisine, he returned to Kyoto about four years ago and immersed himself in the classical styles of Kyoto cuisine at some of the city’s best restaurants. His experiences included preparing the highly refined Zen temple vegetarian food of Izusen known as shojin-ryori, composing the traditional multi-course kaiseki tea ceremony meals of Kitcho (three Michelin stars), and cooking the light, natural, traditional Kyoto cuisine of Wakuden (two Michelin stars). He also spent time at Nakahigashi, helping to innovate their unique obanzai dishes that are focused on indigenous, often foraged, ingredients (two Michelin stars). When Shigeru decided to open his own restaurant he chose Takagamine, as he says, “to be close to the vegetables and to be inspired by nature.” Takagamine is famous for its vegetables, heirloom Kyoto vegetables known as kyo-yasai, which benefit from the area’s nutrient-rich, well-drained soil and its warm days, cool nights, and four-season climate. 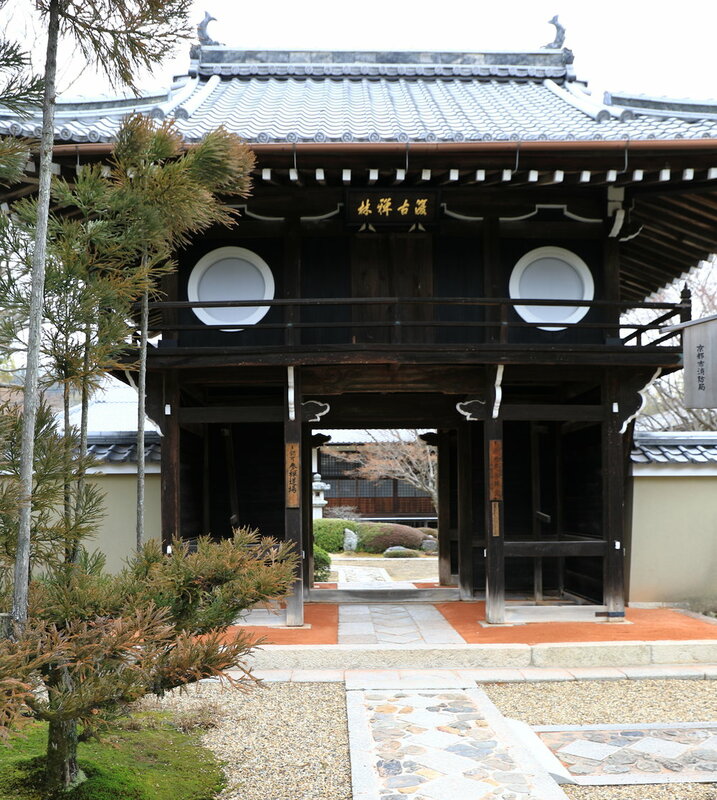 It is also famous for being the place that the Rinpa school of art emerged in 1615 among a community of artists working under the influence of Tawaraya Sōtatsu and Hon'ami Kōetsu at the latter’s Takagamine estate (today’s Koetsu-ji Temple). One of Japan’s major art movements, Rinpa was an indigenous school of Japanese aesthetics that celebrated nature’s beauty through the refined elegance of its compositions, nature’s power through the use of vibrant colors and bold designs, and nature’s harmony through a strong sense of rhythm and pattern. The Rinpa style continued on through the Edo period and still influences artists today across a range of forms—painting, ceramics, textiles, lacquerware, garden design, and, in Muroi's case, cuisine. The most well-known and widely-used kyo-yasai in Japanese cooking is kujo-negi, which is a large scallion that is prized for its long, sleek, green stalk and mild savory-sweet onion flavor. It is shown here with another kyo-yasai—the vividly red, beautifully tapered, and intensely sweet kintoki ninjin carrot. The bold, elegant, and rhythmically soothing byobu folding screen called "Irises" made by Ogata Korin (1658–1716) is one of the most representative and famous works of the Rinpa school. Shigeru begins each day by driving up Mt. Takagamine to collect water from the spring known as Funamizu at Kiyomi Pass. 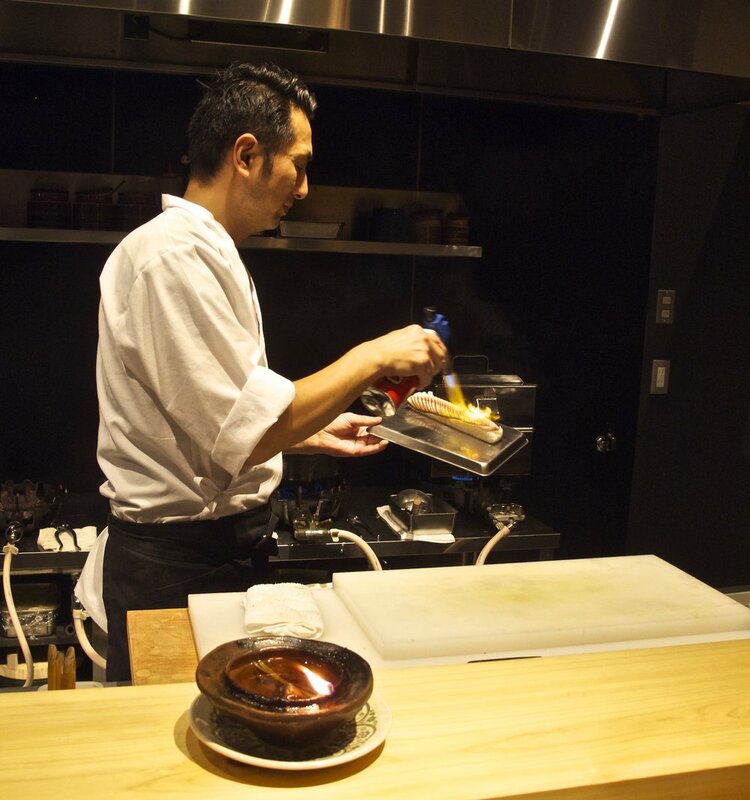 He uses this pure, mineral-rich water to make the rice and dashi stock that are the foundations of his cooking. The journey is also an inspirational start to his day given the sacredness of the spring in local folklore, the beauty of the mountains and forests in all their seasonal variety, and the spectacular view of Kyoto city. Once back down the mountain at the restaurant, Shigeru begins to plan the day's menu by simply crossing the road to pick vegetables at Higuchi Nouen, or Farm. Higuchi Farm has been raising vegetables at Takagamine for over 400 years and has had a leading role in cultivating kyo-yasai. Kyo-yasai are a variety of vegetables that are unique in terms of their attractive colors, beautiful aromas, odd shapes, deep flavors, and rich nutritional value. They evolved during 1,200 years of farming at Kyoto in line with the Japanese penchant to help nature be the best it can be (Kyoto’s gardens are a related form of cultivated artistry) and also to create, as Shigeru says, “vegetables that have power” to underpin the country’s Zen vegetarian culinary tradition. In more recent years, Masataka Higuchi, the current head of the family, was a leader of the movement in the late 1980s to protect and ensure the quality of kyo-yasai through the implementation of a designation and branding system. Today there are about 40 different varieties of vegetables that are designated kyo-yasai by the Kyoto prefectural government. 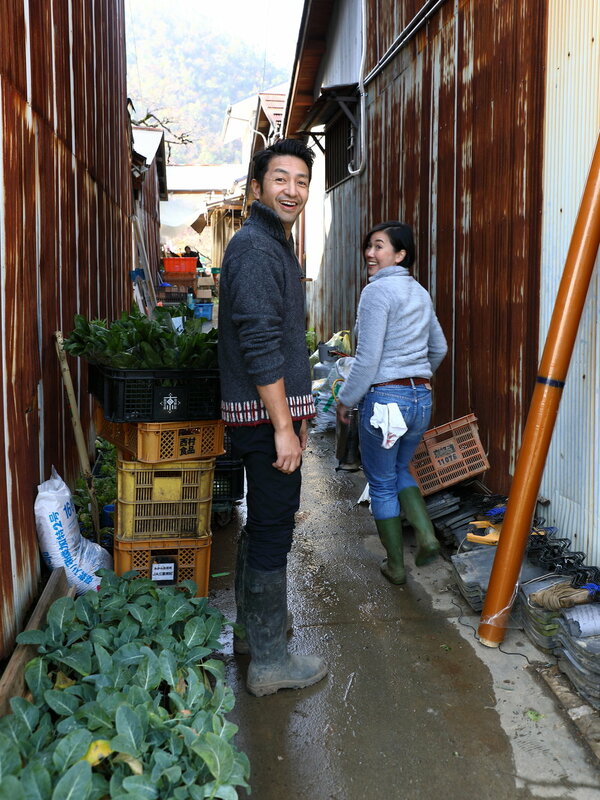 While the farm is bustling each morning, packing and shipping fresh produce to many of the best restaurants across Japan, Shigeru has the rows of vegetables virtually to himself. What he looks for are the vegetables that are at the peak of their season and those that are the most intensely flavored because they have been stressed in some way. 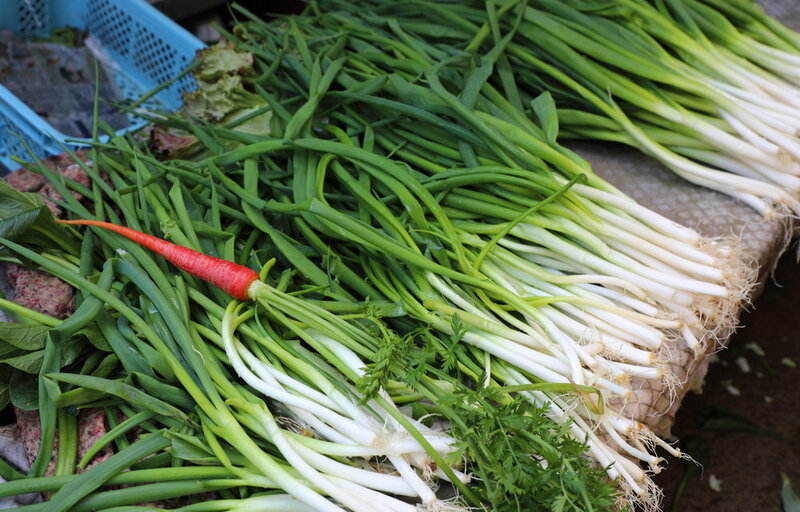 These vegetables reveal their specialness by being crooked or by having an awkward growth or an extra shoot, and will be among the stars in the evening's meal. Not all of the vegetables used at Muroi are kyo-yasai. Japan has one of the richest biodiversities in the world, and not surprisingly for an island nation, a large portion of its plant life is unique to the country, making for many interesting culinary items. Nor are all of the ingredients that Shigeru uses immediately local. His focus is on best in class in terms of quality and flavor, and he sources vegetables from other farms in the area and from across the country. This includes, for example, the famous vegetables of Ohara in the mountains northeast of Kyoto, lotus roots from Kaga prefecture, and nikkori-nashi pears grown in a friend's garden back home in Tochigi. 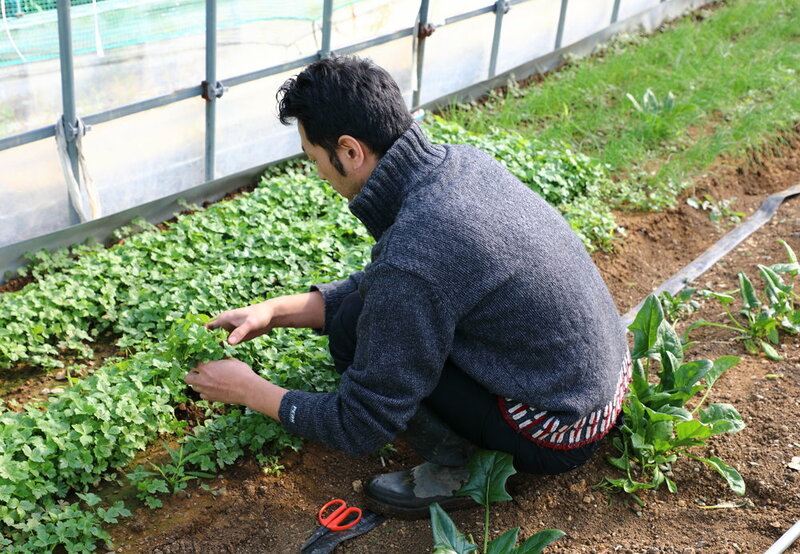 Shigeru gathering mitsuba, an herb that will be used to season the evening's meal. One of the great innovations in the history of Japanese garden design was the creation of stroll gardens during the Edo period. Until then gardens were largely three-dimensional landscape pictures that were enjoyed from the house or verandah of a temple. 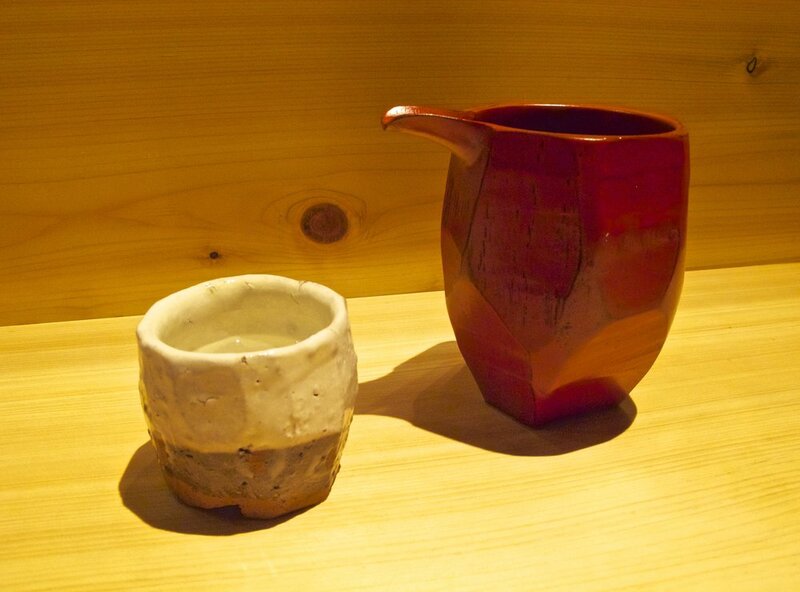 With the introduction of stroll gardens the viewer was invited to “enter the picture.” Dining at Muroi is similar. You enter the picture and eat the culinary art. 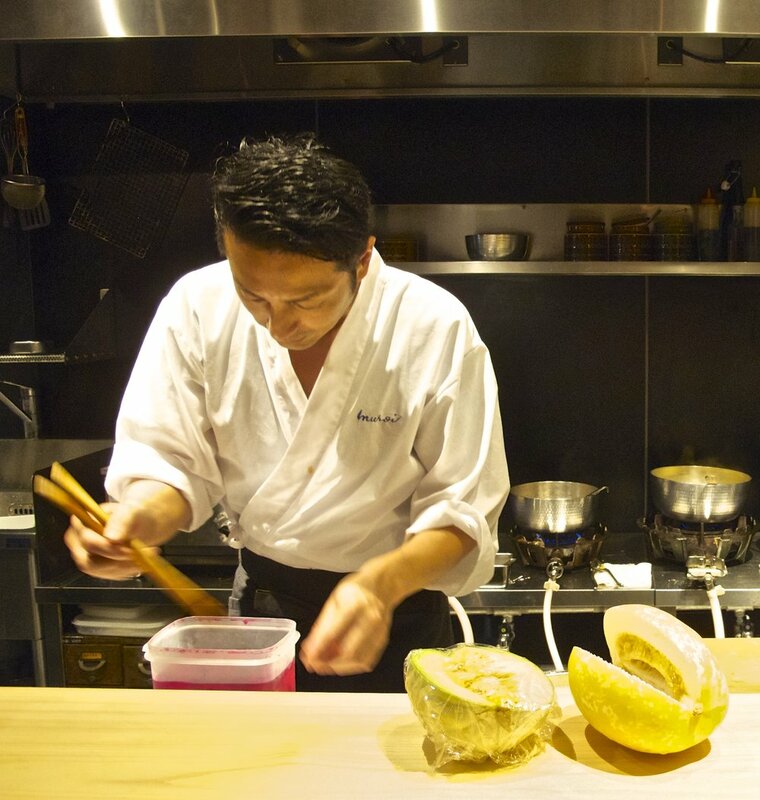 Each night Shigeru prepares a multi-course dinner based on the best of what is in season, and the menu changes daily. He follows nature’s broad definition of vegetables, which includes all plant life, versus the culinary definition, which are those plants that are traditionally eaten. He also uses all parts of the plant, and his dishes include grains, nuts, and fruits and the roots, tubers, stems, stalks, leaves, seeds, and flowers of plants. Despite his classical training, there are no rules to Shigeru’s cooking and nothing to distract from the food. To some degree the courses follow those of kaiseki cuisine, but loosely and creatively. The dish ware he uses beautifully frames the food but does not compete with it for attention. Seasoning is light and basic—mostly salt and citrus, occasionally a little vinegar, soy sauce, sake, mirin, or sugar. The principal way flavor is enhanced is through a range of heating techniques—blanching, boiling, steaming, smoking, searing, grilling, and frying. These can be as short as searing a piece of fish with a torch or as long as boiling Horikawa burdock, one of the great kyo-yasai, for three days in an iron pot until it absorbs the pot's black color and some of its minerality. Shigeru's focus is on the complex and seemingly infinite interplay of color, aroma, shape, texture, and taste of the many vegetables at his seasonal disposal. His challenge is multiplied by the fact that he uses vegetables not only as the main constituents of each dish but also as their seasonings and flavorings. Tiny mukago yam tubers, shiso seeds, fresh wasabi leaves and toasted takana mustard leaves and hinona turnip leaves, among others, are used to add heat, spice, and flavor to dishes. Sauces, pastes, relishes, and jellies made from sesame seeds, soy beans, tomatoes, cauliflower, sun chokes, spring onions, and chrysanthemum leaves are autumnal condiments. In constant graceful motion in the open kitchen behind the counter, Shigeru masterfully combines all of these ingredients into beautiful, delicious, and seasonally evocative works of culinary art. The following meal took place on a mid-autumn evening. Despite the demands of preparing ten courses for ten guests each night, Shigeru is always graciously ready to tell you about the ingredients and answer any questions about his techniques and recipes in both Japanese and English. The first course is a kind of amuse-bouche. 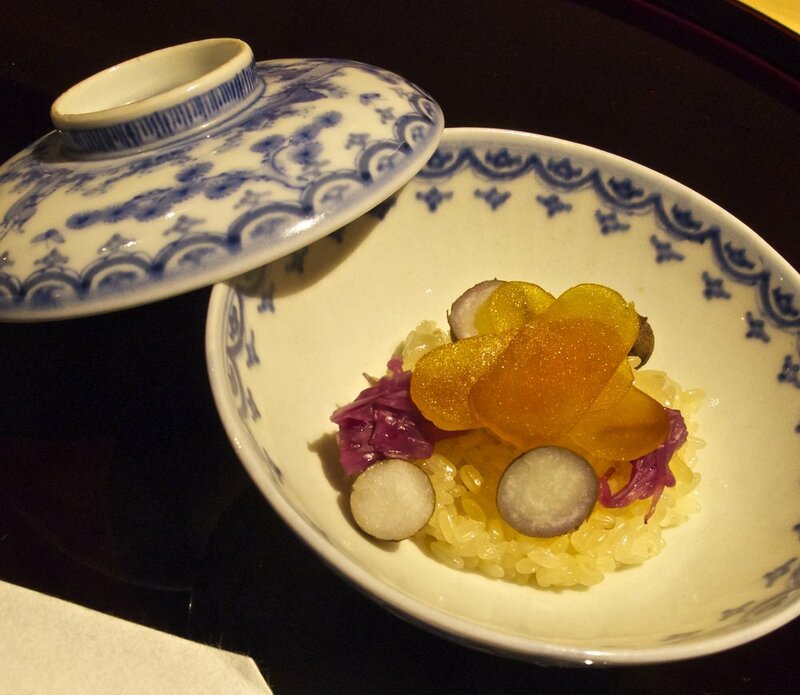 In this case it is a beautifully composed small bowl of sticky rice topped with slices of bottarga (cured fish roe), tiny chunks of mukago tubers, and pickled purple chrysanthemum leaves, which are the seasonings and flavorings. It is an appetizing conceit of an entire meal of fish, rice, vegetable, and pickles in one dish. The home-made bottarga is exceptionally mild, luscious, and creamy because Shigeru not only salts the fish roe but also preserves it in shochu liquor for one year. The second course is a robust still life of foods that sets the seasonal theme for the meal. It is also a bravura demonstration of the ingredients and Shigeru's cooking. In front: a deep-fried Tamba chestnut and boiled peanuts. Behind that from left: sukina kabocha pumpkin, the tuber and leaves of hodo-imo potato, the tuber, stem, and leaves of satsuma-imo sweet potato, and a small green saru-nashi fruit. In the last row are several kinds of seafood. From the left: camas barracuda sushi, sugiko salmon eggs, and chirimen whitebait mixed with green togarashi peppers in a cup. The clear soup course is a pool of the earthy flavors and muted colors of late summer and early autumn vegetables. The dashi broth is made with the mountain water that Shigeru collects each morning and fortified with the pure, rich umami flavor of maguro-bushi. These are the dried flakes of pure tuna rather than of the skipjack tuna used to make katsuo-bushi, giving his dashi broth a mild elegant dose of umami rather than a smoky flavor. 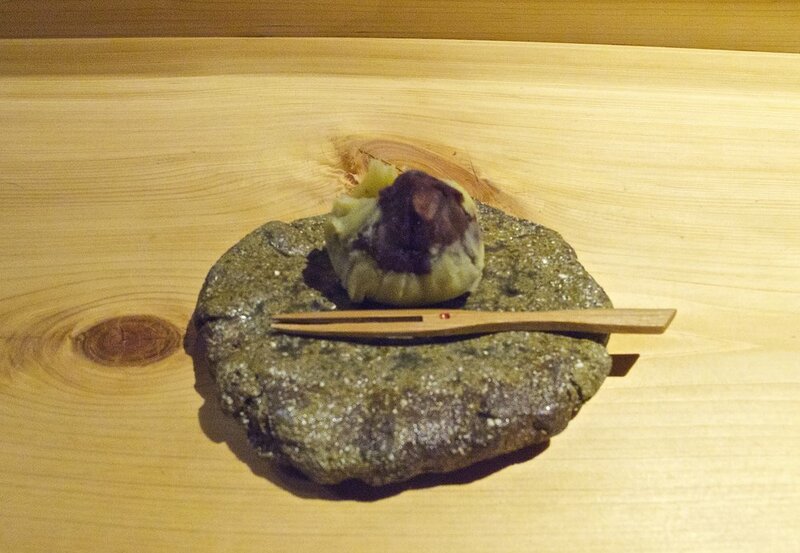 The vegetables include a wedge of green aubergine, an intensely flavorful thin side-shoot from a yellow mabikina carrot, slices of shiitake mushroom, thick juicy tsuruna leaves, and mizu buds. 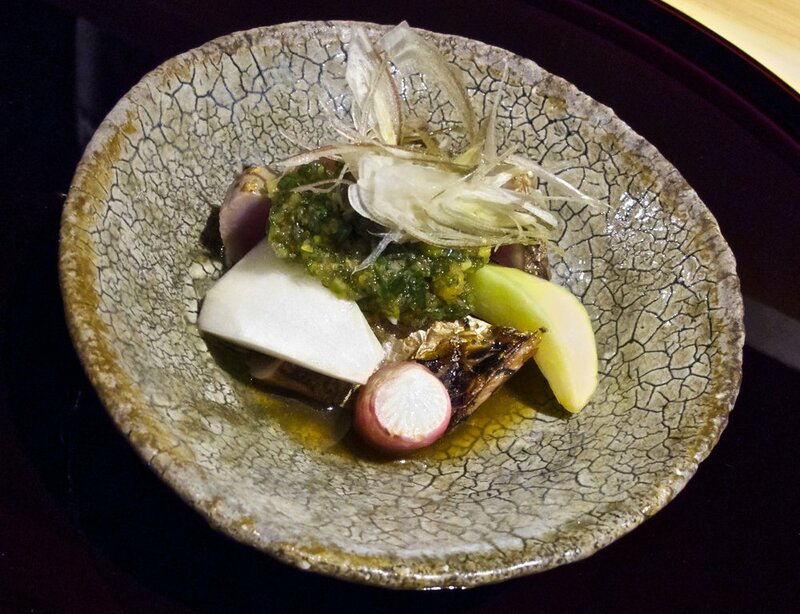 The takiawase course of a kaiseki meal is a dish of vegetables served with fish, meat, or tofu. At Muroi it consisted of several thick slices of smoked bonito tuna that were layered by a variety of cool and refreshing cucurbits: chunks of heirloom katsura-uri melon, makuwa-uri melon, and simple red radish. The relish on top is chopped spring onion, radish, and chili mixed with yuzu ponzu and pepper. The cap is a bud of myoga ginger. 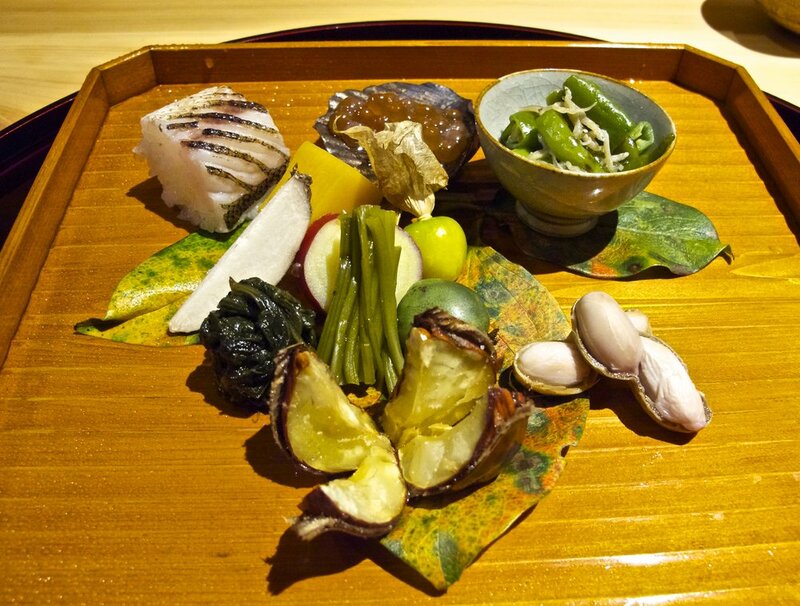 A course of grilled vegetables and fish is a composition in the bold colors and distinctive shapes of Rinpa art with the added dimensions of crunchy textures and strong flavors. It is another complete meal in one dish, and includes the big white shoots of makomotake wild rice, sweet yellow and green beans, and a sour red beet pickled in vinegar on the left and a piece of fatty flame-grilled salmon covered in an umami-rich tomato sauce on the right. The large phosphorescent green-yellow square bean with serrated edges in the center is a deliciously bitter shikaku-mame. 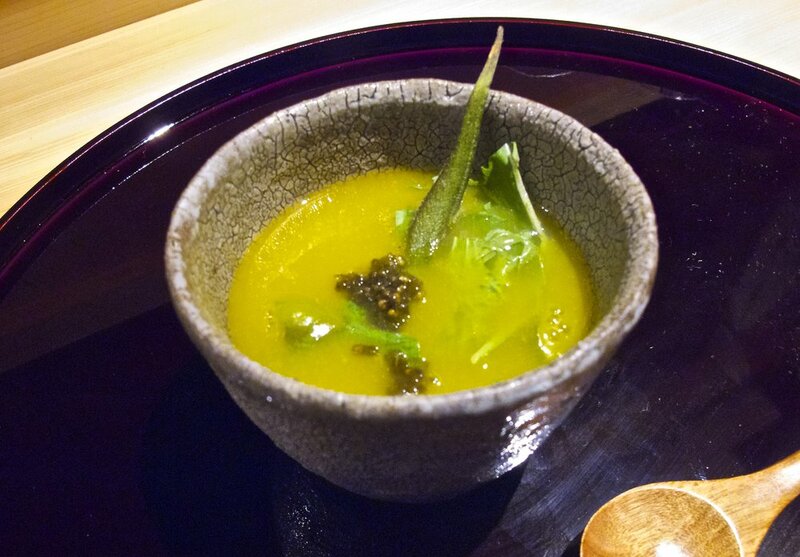 The soup course is butternut squash cooked simply in a vegetarian konbu dashi stock. It is made to live up to its rich earthy name by the addition of a knob of cultured butter just before serving, giving the soup a strong buttery aroma, taste, and texture. Toppings are crunchy pungent shiso seeds, peppery slightly bitter mizuna leaves, and a piece of silky okra. 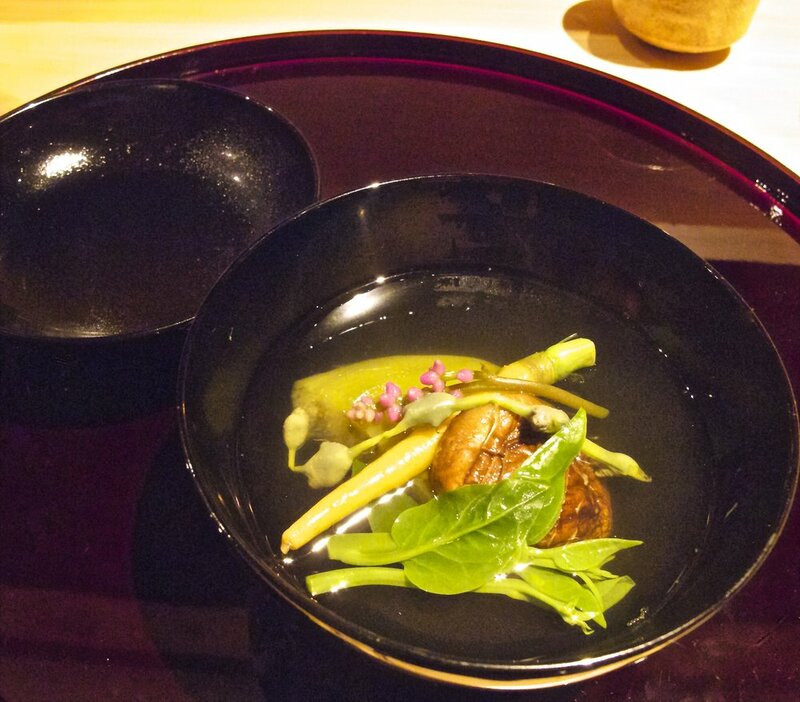 This is a substantial dish in which Shigeru has showcased a variety of tubers (imo in Japanese) and roots. The centerpiece is a paste made of ground Kaga renkon lotus roots and very white, sticky and fine-grained yamato-imo potato that has been rolled into balls and double-fried to heighten their richness as well as give them a lovely crispy crust and light fluffy interior. This is served with a piece of boiled sato-imo taro on the side and topped with bright red and spicy manganji togarashi pepper, light and refreshing kushinsai water spinach, and bitter and crisp saru-togan winter melon slices. 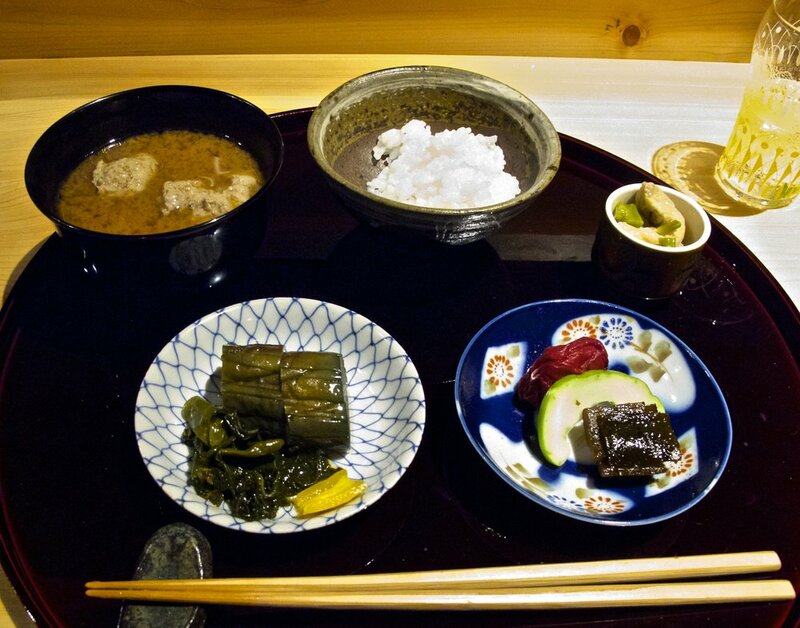 The rice, soup, and pickles course of a Japanese meal is considered the main course, with everything that came before it being appetizers. This is definitely true at Muroi, where this course is truly a meal in itself. The rice, which is as much as you want, is grown across the road at Higuchi Farm. Its quality is evidenced by how iridescently shiny it is. The soup is a deeply satisfying strong red miso soup filled with meatballs made of duck raised on Mt. Katsuragi in Nara prefecture. Dessert is a piece of nut cake accompanied by several sweet and juicy seasonal fruit with a range of textures, including lush persimmon, crisp Kyo-tango pear from the Tango Peninsula north of Kyoto, soft, grainy nikkori-nashi pear, and bright tiny Niagara grapes. The second dessert is a handmade wagashi of sweet red azuki bean paste covered in a rich, creamy white bean and chestnut paste formed to look like a chestnut. Served with a cup of tea it is designed to warm the body as you leave the restaurant on a cool autumn night. In winter, the meal often starts with such a sweet and a cup of tea to warm you up before the meal. A folding screen titled "Vegetables with Insects" by Kittsu Suzuki (1796 – 1858), a painter of the late Rinpa school. The earthy colors of the old kominka, or farmhouse, that houses Muroi are typical of rural architecture in the mountainous areas of Kyoto prefecture.Muroi ready to receive guests for dinner in the evening. The restaurant serves dinner every day except Tuesdays at 18:00. There is one seating and guests are expected to arrive between 17:45 and 18:15. The meal is a set course that changes daily and lasts for about 2 1/2 hours. The price is a very reasonable ¥10,000. Reservations are a must because of the restaurant's small size and rapidly-growing reputation. Update: Muroi was awarded a Michelin star in the “2019 Michelin Guide Kyoto Osaka”. Although Muroi does not have a large selection of alcohol, the sake and shochu on offer are special, with several being from Shigeru's home prefecture of Tochigi. The quickest way to get to Muroi from downtown Kyoto is to take a taxi. In the evening this is surprisingly easy and reasonable, and the ride takes only about 15 minutes and costs around ¥1,500. By bus Muroi is about an hour from downtown Kyoto. Take the #12 bus to the Kitaoji Horikawa stop, then walk across the street and catch the North #1 bus to Dotenjo-cho. The restaurant is across the street from this stop. 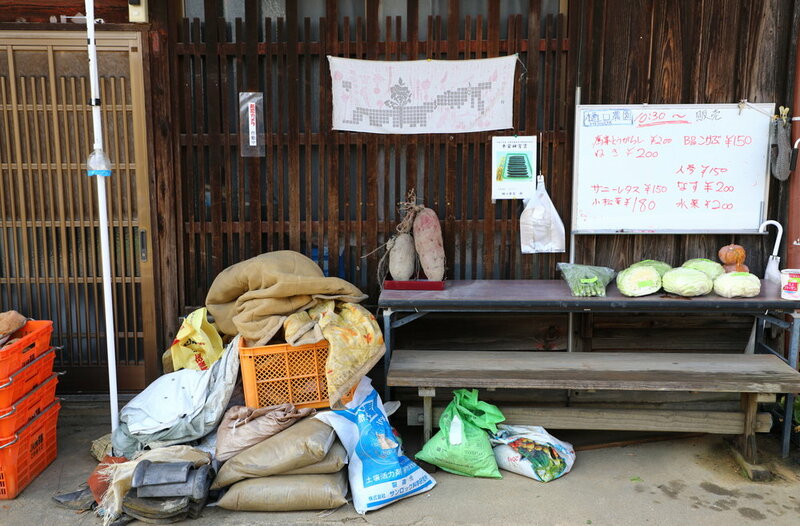 Vegetables for sale on benches in front of Higuchi Farm. Higuchi Farm is located directly across the street from Muroi, but access to the farm is only for professional chefs and restauranteurs. For other customers, fresh vegetables are put out daily on benches in front of the farm from around 9:00. Items are added as they are harvested until about noon.You pay by either getting the attention of someone in the back or by depositing money in a coin box. At night the vegetables are marked way down, and you can do a bit of shopping before dinner if there is anything left. The farm also sells its vegetables at the Toki-machi-shoku shop in the Kita-Oji Shoten-Gai, or Kita-Oji market arcade. Toki-machi-shoku are farmers' market stands that are sponsored by the Kyoto municipal government to support the city's farmers, and can be found near major bus terminals and subway stations. The Kita-Oji shop is on the north side of Kita-Oji Street, a block west of the bridge crossing the Kamogawa River. It is open from 11:00 to 17:00 except for Mondays, Tuesdays, and national holidays. It is best to get there before noon, when most items are sold out. 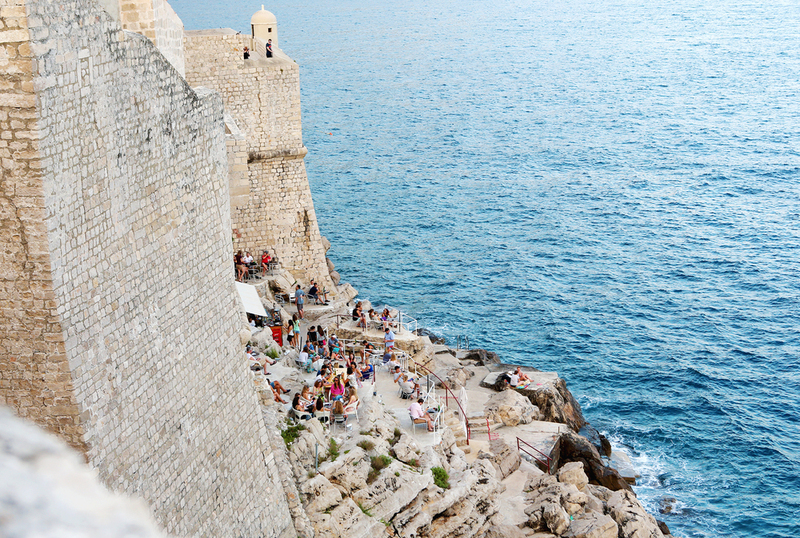 These shops are well worth a visit. In addition to getting great quality, freshly picked Kyoto heirloom and other vegetables, most bags of produce are priced at a mere ¥200. Spinach, kintoki ninjin carrots, yama-imo mountain potatoes, kiku-imo sun chokes, and Takagamine green togarashi peppers from Higuchi Farm at the Toki-machi-shoku farm shop. As an upscale residential neighborhood with a rich history as a country village, Takagamine has charm, elegance, services, and cultural treasures. It is a great way to experience the serenity and beauty one associates with Kyoto. Given how easy it is to get to the city center, Takagamine would also be a good area to stay in. However, the only hotel is a members-only Tokyu Harvest Club. This situation will be remedied when the Aman hotel chain opens its first Kyoto hotel in Takagamine at the end of 2018. In the meantime, one can spend an enjoyable day wandering around and exploring the area and nearby sights, ending with dinner at Muroi. 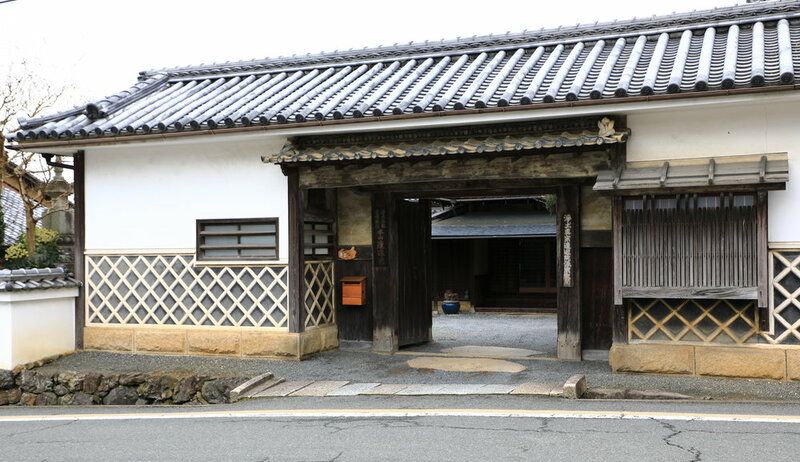 Large handsome gates like this one were typical of the properties of prosperous farmers in Takagamine during the Edo (1603-1868) and Meiji eras (1868-1912). Located just a few paces up the road from Muroi on the opposite side of the street, Matsuno Soy Sauce has been brewing soy sauce since 1703. The current brewer Denkichi Matsuno is the 14th generation of the family. The heady, appetizing aroma of soy sauce fills the neighborhood when brewing is underway, making it hard to resist stopping by the shop to buy some of Matsuno's soy sauce and miso products. Their packages of soy sauce-laced, roasted sesame seeds are especially delicious and handy to have as a savory crunchy condiment for practically any kind of dish. The shop is open from 9:00 to 18:00 everyday except Thursdays and national holidays. Established in 1346, Genko-an is a Zen temple and garden that is famous for its "bloody ceiling," which is made from the blood-stained floorboards of Fushimi Castle when the samurai warriors defending the castle in 1600 killed themselves upon their defeat. Next door is the temple of Joshi-ji, a rustic country temple associated with the Edo-era courtesan Yoshino Tayu II, who was known for her beauty and grace. The famous Windows of Enlightenment at Genko-an. The temple and grounds were once the estate of Hon'ami Koetsu (1557-1637), a renowned and accomplished calligrapher, potter, and sword maker who was one of the two founders of the Rinpa school of art in the Edo period (1604-1868) along with Tawaraya Soatsu. The exquisite and beautifully-maintained garden is unique in Japan. It is a contemplative Zen dry rock garden in the form of the stroll gardens that were made during the Edo period. Instead of observing a fully-realized, three-dimensional, and often symbolic "painted" landscape from the temple's verandah, as is typical for Zen dry rock gardens, you actually enter the quiet world of beauty and introspection at Koetsu-ji. The gravel path is a stream that takes you on a spiritual journey through the garden as it "flows" past scenes of nature and teahouses hidden in the woods and creates pools, cascades, and lakes with islands as it widens and narrows, goes down steps and around moss-covered mounds. The garden uses all of the classic stroll garden techniques, including movement along the diagonal, "hide-and-reveal," and "borrowed" scenery, to heighten the experience of awakening and enlightenment. The formal entrance to the temple and garden of Koetsu-ji. 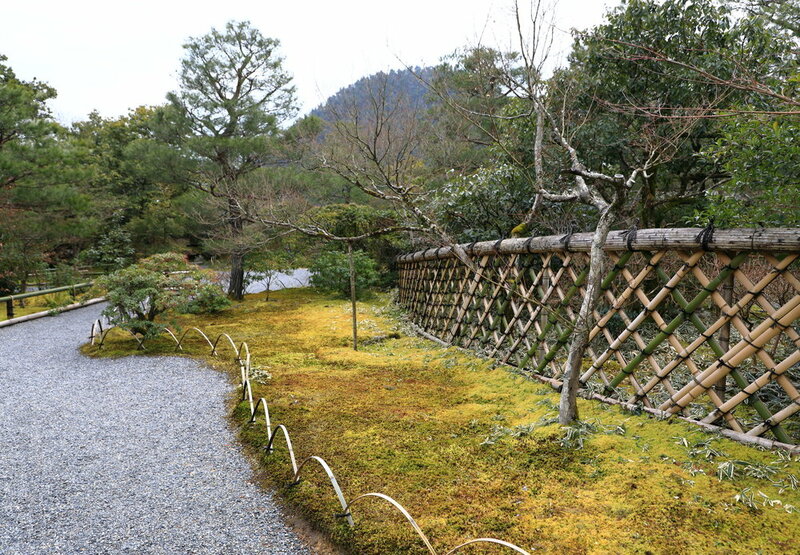 The famous woven bamboo fence in the garden with Mt. Takagmine in the distance. All three key elements of Edo-era stroll garden design are at work here: movement along the diagonal, "hide-and-reveal," and "borrowed" scenery. About two kilometers below Takagamine, at the base of Mt. Takagamine, is the Kamigyo ward of Kyoto, which is one of the city's two original districts. The northwestern corner of the ward is a quiet, elegant residential neighborhood centered around the vast and impressive Kitano Tenmagu Shrine, which was established in 947 AD and is dedicated to Sugawara no Michizane (794-1185), the patron saint of academics. In the area is one of the largest concentrations of Zen temples and gardens in Kyoto, making it a great place to experience the spiritual power and creative diversity of Zen culture. Daitoku-ji - Built in 1319, Daitoku-ji is one of the largest extant Buddhist temple complexes in Kyoto. Its twenty-three sub-temples, eight of which are regularly open to the public, possess some of the finest Zen buildings, gardens, and artwork in Japan. The temple is also a leading center of the tea ceremony. Kinkaku-ji - Built in 1395, Kinkaku-ji, also known as "The Golden Pavilion," is one of Japan's most magnificent stroll gardens. While it may seem florid at first, take the time to appreciate it as a garden that has been intricately designed to be a paradise on earth. Ryoan-ji - Created in 1499, Ryoan-ji is Japan's most famous dry stone landscape garden. The much larger outer garden is also beautiful and much less crowded. Toji-in - Built in 1341, Toji-in's small hill and pond garden is one of the most refined and elegant gardens in Kyoto. Located across the street from the torii gate entrance to the Kitano Tenmagu Shrine is Toyouke Jaya, a shop and restaurant established in 1897 that is justly famous among Kyoto residents for its fresh tofu, yuba tofu skin, and thick and creamy soy milk. The restaurant is located upstairs, above the open-air counter shop, so be careful about which line you get in. Toyouke Jaya is open for lunch from 11:00 to 15:00 every day except Thursdays and the 25th of each month. Given its local popularity, there is always a line for the restaurant, but turnover is fairly quick and the food worth the wait. The house speciality is"Nama Yuba Donburi," which is a bowl of rice covered with fresh yuba that is smothered in a thick sweet sauce. Toppings of grated ginger and chopped mitsuba leaf add piquancy. The dish can be ordered either separately or as part of a tray lunch set that includes pickles and tea. A more savory dish is "Toyouke Donburi," which are chunks of fresh tofu and abura age (deep-fried slices of tofu) over rice that also comes stand-alone or as part of a tray lunch set. 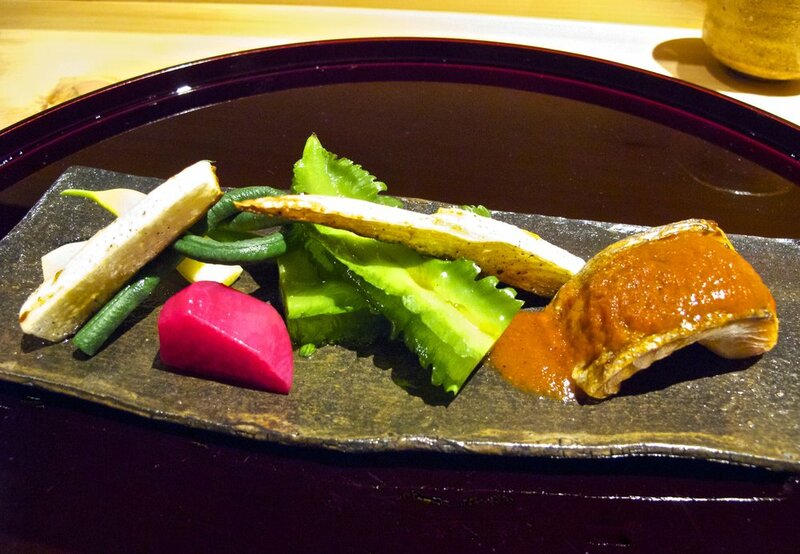 A side dish of "Kuromame Dofu" is tofu made from the rich-tasting black beans of the Tamba region west of Kyoto.